The Dell SonicWALL ADSL Annex B Module creates an edge-securer router that delivers high-performance connectivity leveraging the firewalls’ routing, Unified Threat Management, Next-Generation Firewall, and Application Intelligence, Control and Visualization. 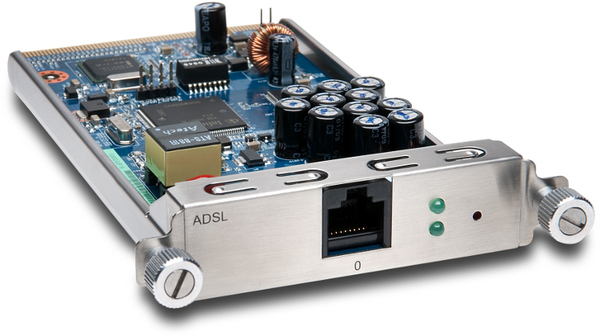 The ADSL Annex B Module consolidates secure router and firewall solutions by enabling connection of an asynchronous digital subscriber line circuit to the Dell SonicWALL NSA 2400MX or NSA 250M. The Annex B module adheres to the ITU G.992.1 Annex B standard, which supports ADSL over ISDN. By consolidating solutions, the ADSL Annex B Module significantly reduces hardware infrastructure costs, lowers administration overhead and eliminates potential points of failure associated with separate multiple-vendor solutions. As easy-to-implement plug-in components, the ADSL Annex B Module adds new functionality immediately upon rebooting the firewall.